If you need your hands free for conducting or practicing, this customized metronome/pitch pipe will make it easy. Simply plug in the included foot pedal, step on the pedal and the metronome will start, press again and it will stop. Below are the features of the metronome/pitch pipe. 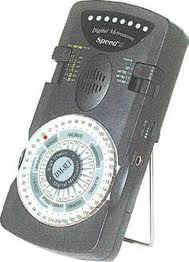 This is the loudest dial metronome & pitch pipe available... easy to operate with many features. Range : 40-216 beats per minute using a large easy to read and easy to turn dial. Increments by standard musical tempos. Light and or click - this metronome is one of the loudest we have found ... with a great clave (wood block) tone and full range volume control. 8 color LED's move with beat - when in the accenting mode the first light will flash green -- all others are red. Chime - bell accents downbeat on 0,2,3,4,5 & 6. When set to 0 there is only the clicking - clave tone. Also 6 beat sub-divisions -- Eight Note, Triplet, Sixteenth, Dotted Eighth, Triplet & Sixteenth with rests. Earphone jack 3.5mm - earphone not included. Uses 9 volt battery - included. Size: 2 1/2"w x 5 1/2"h x 1"d. Weight 6 oz.